On November 1, the ‘Eröffnungsturnier’ Satellite was organised by TFC Wien West in Austria. Alfred Strommer’s club is back in action after a break of a few years and it’s very positive as there are several new players in the U12 category. 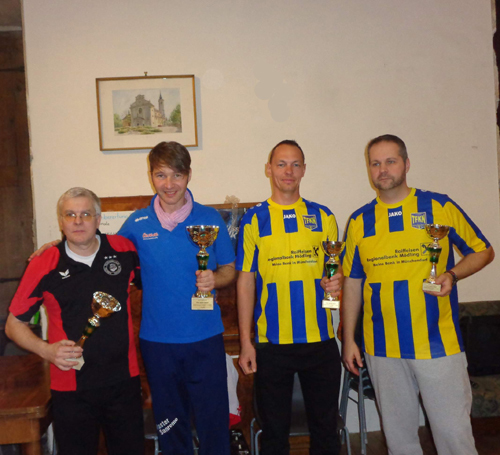 As for the results, David Busch defeated Erich Hinkelmann int he final after scoring many goals. David scored the winning goal in sudden death (6-5). Thomas Eppensteiner and Hungary’s Gabor Baross were the semi-finalists. The U12 tournament consisted in a group of 5 and Pauli Rauchenschwandtner was the winner with 10 points. Besides the games, there was a social side of the tournament as Hussein Bakhshi, a refugee from Afghanistan living in a Austrian family, became the first player from his country to attend a Subbuteo tournament.